Check out this potted topiary tree made out of rosemary. Placing it in the center of the gardening area gives the display lots of height and interest. Surround the top of the pot with colorful edible flowers. Around the base of the pot are lots of herbs like basil and thyme. 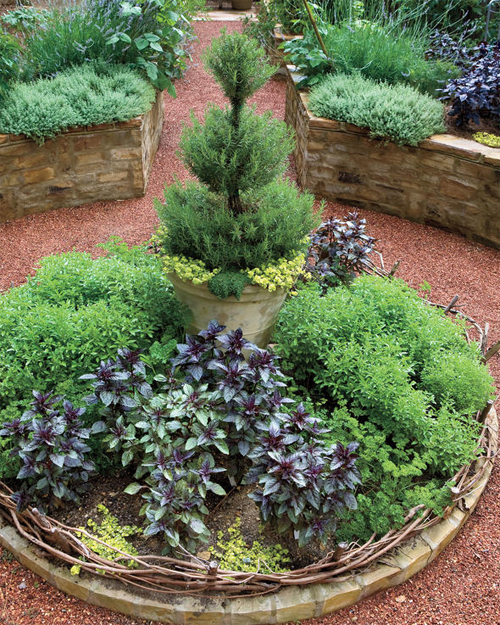 You could just plant the rosemary in the center but by placing it in the garden planter you get the vertical height that really shows it off. 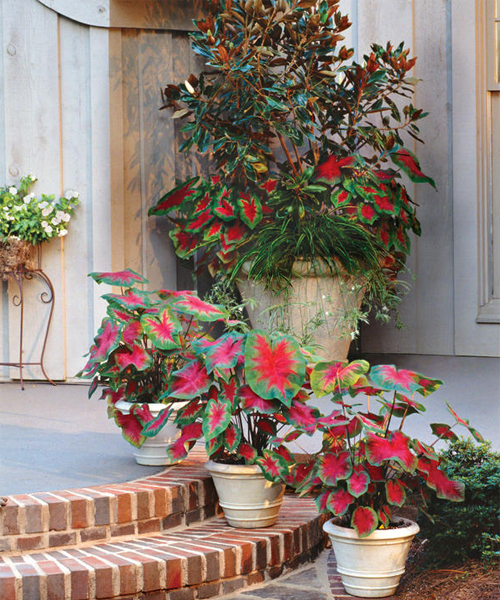 Here we have potted Red Caladiums, spider plant and southern magnolia. Each decorates the pots and ties them all together. The large pot in the back is covering a downspout that is unsightly. The planter holds a large display that is beautiful and draws you eye away from the spout. The 3 smaller ones are stair stepped and tie themselves together with the larger one in the back creating a organized and beautiful display. Our last display is a grouping of terracotta planters and saucers displayed by a entryway. Combine daffodils with citrus hues and fragrant seasonal blooms for a colorful display that just keeps on giving. This trio holds calibrachoa, fragrant sweet alyssuma and cool nemesia. All Friendly, brightly colored and wonderful soft looking flowers and plants. Perfect in the natural finish of clay pottery. Read more.....Potted Jasmine to help sleep. Start by placing the garden planter where you want it to stay. These grasses are a great way to create privacy because of their height. They are perfect for apartment dwellers who have balconies, how about to block a neighbor's view or lined up along your deck or patio area. Since they prefer some sunlight daily you should make sure they aren't in a shaded area. Make sure the garden planter you select has a drain hole and is deep to handle deep root systems. This is not the time to use a garden bowl or wok pot. Go with glazed, poly resin, concrete or a high fired clay. You need a garden pot that will hold up to these deep roots. Fill the planter with good potting soil mixed with perlite. Water when the soil is dry. Don't let the roots sit in standing water. Fertilize in the Spring like you would with most plants and don't over-do it. Always follow instructions for the best outcomes. 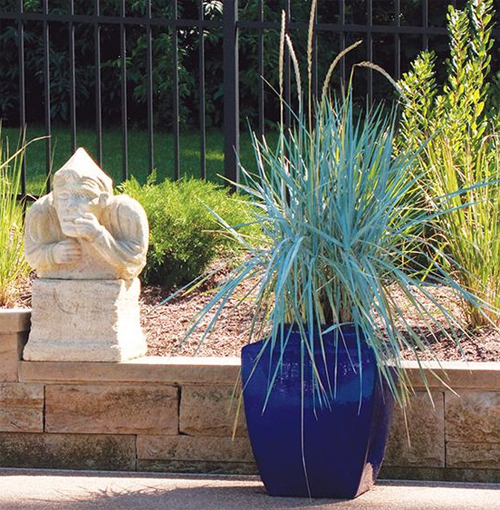 Try some grasses like Bamboo Muhly, Red Fountain Grass, Japanese Forest Grass or Blue Lyme Grass. These are all beautiful, colorful grasses that are perfect potted up and displayed. 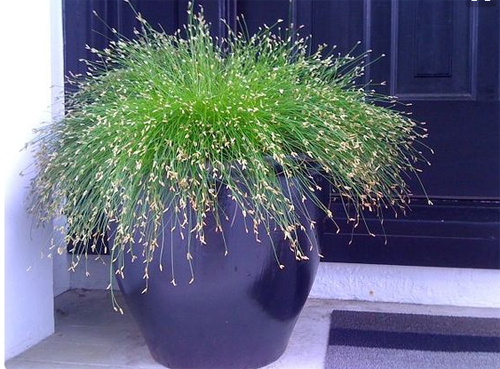 There are others that are really unusual like Fiber Optic Grass, Miscanthus or Feathered Reed Grass. Try googling the term and you will find all kinds of suggestions. Good Luck and share with us how you do. Read more.....Turn a Fuchsia into a houseplant.